Heru's wife gave birth to his first child, a son! An industrious day on Ocelot, with some things moving forward, and some sideways. Some of the best forward progress was with the cockpit teak. Houa appeared with a big sanding disk first thing, and Sue rapidly cleaned up tools, parts, and other miscellany around the cockpit and covered it all in plastic. Sawdust again? Been there. Done that. While Houa sanded the new black Sika caulking, Yando followed closely with R2D2 (the shop vac) to try and keep the dust under control. Because the big sanding disk leaves swirl marks, Houa followed it with the small orbital which (thankfully) makes much less sawdust. 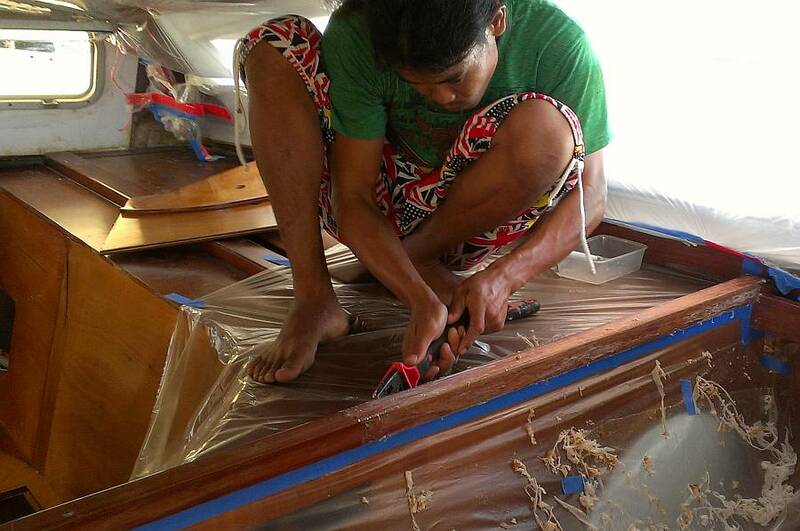 Once the teak was cleaned off, Houa showed Yando how to mask the gelcoat around the edge of the teak with blue tape and duct tape. This lets the men sand the sharp edge of the teak without damaging the gelcoat that's only a few millimeters below. 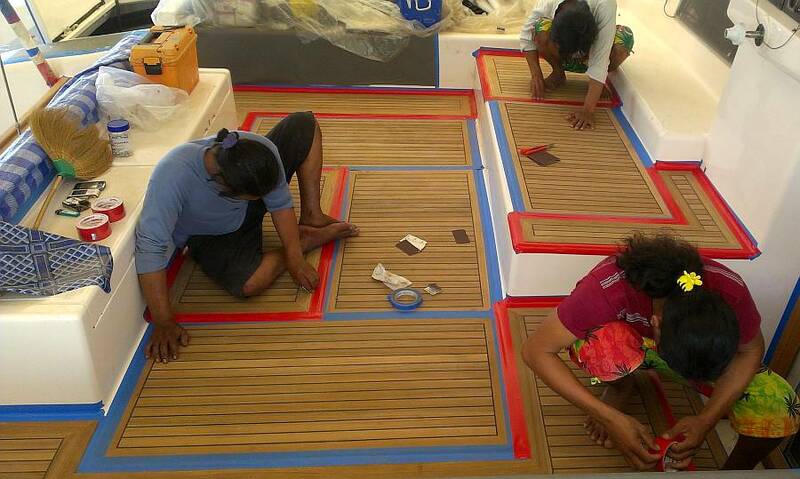 Both Yando and Chambron worked all afternoon on the taping and then finger sanding the teak edges to round them off nicely. A little more work tomorrow and the teak will be officially done and we can start putting the hinges and latches back on the hatches. 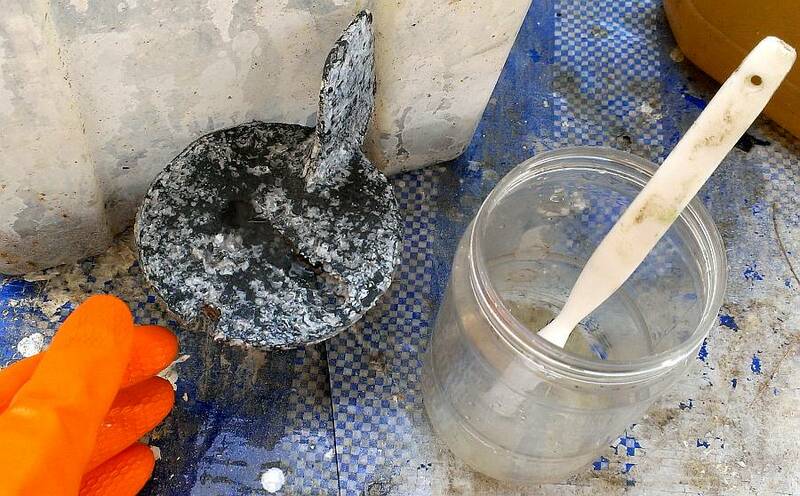 Down in the bilges, Pla continued sanding the old gelcoat and cleaning with acetone. Chambron and Yando both spent time in the starboard deep bilges, as evidenced by their backsides sticking up out of the floor. Heru was the overseer and gelcoat mixer. By day's end they had gelcoated all the aft cabin bilges, and some of the central ones, at least on the accessible sides. 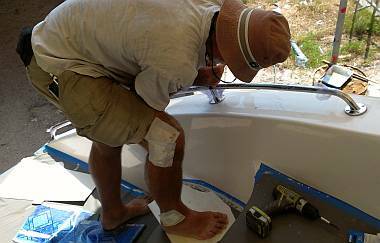 Heru did a bit of fiberglass work in the morning. When Sue was showing him the gelcoated food lockers in the salon, and thought about putting water in there, they realized there was an open corner on the starboard aft side from when the floor boards were re‑built near the entryway. So Heru sanded and cleaned the corner, then glassed in a small wall to keep water from running from the salon down into the cabin lockers. It isn't pretty but no one can see it. With a touch of sanding, it can get gelcoated tomorrow. While Sue was checking last Saturday's work in the salon she felt a sharp corner in 2 of the food lockers. Looking in, it appeared that the guys had gotten lazy and merely pushed old gelcoat scrapings and some dust into the deepest, most inaccessible corner. Aha. But Sue does reach in there, to get dropped things, to clean up spilled liquids, and to clean the locker. The potential for fiber‑jammed fingers was high. So, nit‑picky though it was, she pointed this out to Heru, who translated to Pla, who set about remedying the lazy work. The guys actually don't mind this sort of thing, and it lets them know where we feel the quality bar needs to be. Lek masked around the outside edges of the port‑lights in the front of the salon, and sanded the gelcoat. 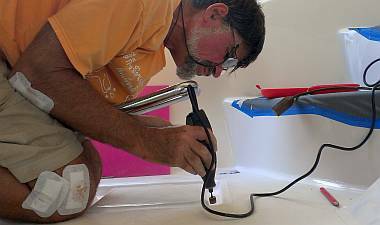 After Jon cleaned the port‑light rims and the masked area, he sploobed a fat snake of silicone on the aluminum frame of each port‑light and nestled them into their openings. Sue lay down outside to watch the placement and to be sure there was sufficient silicone sploobage around the rim as Jon screwed home the mounting hardware. The grab‑rails that mount on top of the sugar‑scoop walls each have 4 mounting pads, each taking 4 screws. 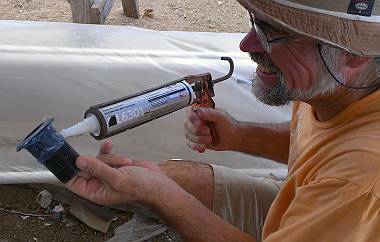 But the screw holes have gotten compromised in the weeks since they were drilled, so Jon filled them in with epoxy on Saturday. Today Lek sanded each of the 32 epoxy filled holes and topped them with several layers of gelcoat, meticulously sanding between layers. He did a much nicer job than was really necessary, as it will all be covered by the mounting pads of the grab‑rails, but he likes to take pride in his work. Now Jon can re‑drill the holes so we can (finally) mount those grab‑rails. Jon's work on the engines didn't go quite as planned. 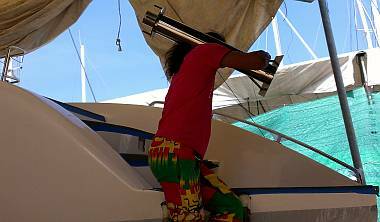 He connected up a water hose to the cooling system on port side, but the engine refused to turn over with the key. It turns over with a jumper to the starter solenoid, so the battery and the starter are OK, but there's obviously a poor electrical connection somewhere. And since it doesn't start, the injector lines probably need bleeding, which isn't too surprising given that the engines haven't been started in several months. Also, Hem, our mechanic, didn't connect up the exhaust system correctly when he reassembled the engine, so Jon spent some sweaty hours in the engine room, wrestling big, stiff, recalcitrant hoses back into place. But to counter that sideways step, Jon had a better than expected shopping trip to our local chandlery, finding some fast curing 5200 adhesive that we'd been told was unavailable in all of Thailand! 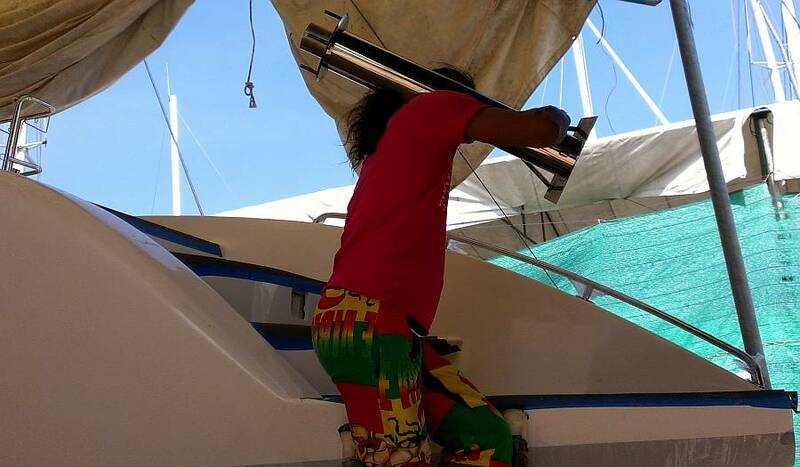 We want it to stick on our new stainless steel protectors, bow and stern. He was also able to find good 316 screws for the grab‑rails (at 50¢ each) so there's nothing else needed for that project. Ben didn't come in so Baw worked alone on Tomcat all morning, sanding the white enamel he sprayed on last week. After lunch he masked around the inflatable tubes and announced that we didn't have enough enamel for the spray. He was impatient to get going, as he had another medical appointment and had to leave in 40 minutes! Sue had just returned from another errand but she scootered out to Jotun and returned with the new enamel in time for Baw to spray Tomcat's bottom with a second coat. Tomorrow is Christmas Eve and we'll be leaving a bit early to scooter an hour north to the beautiful calm bay of Nai Yang, near the airport, for a couple nights with good friends. Oh, gloriousness. Can't wait. Merry Christmas to all! 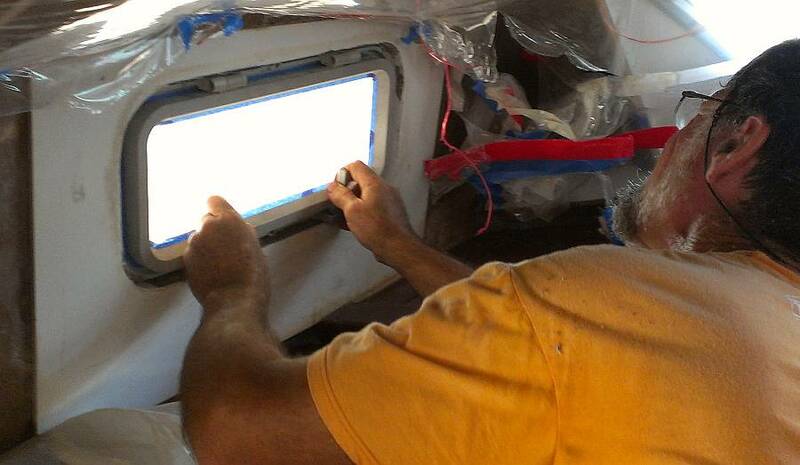 Baw polished the galley windows until they sparkled! 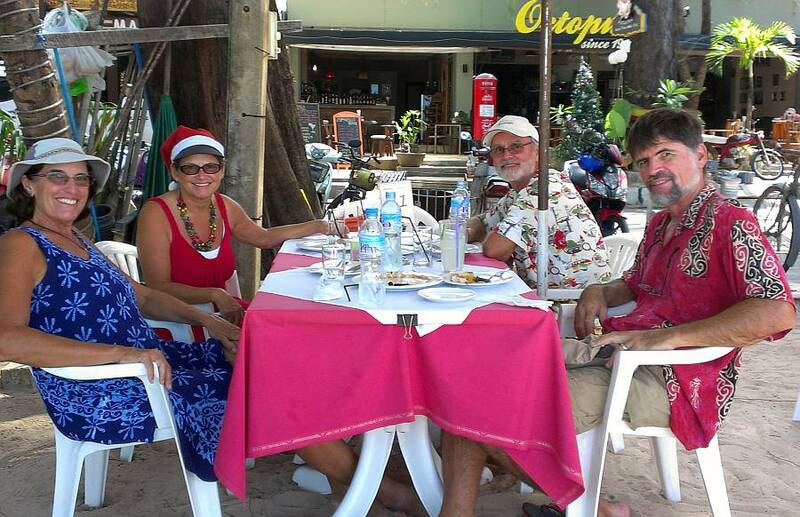 Christmas Eve, and we were distracted by the upcoming holiday adventure ‑‑ 2 days with Canadian friends aboard beautiful CanKata in Nai Yang Bay, northeastern Phuket. But we still managed to get some things done. 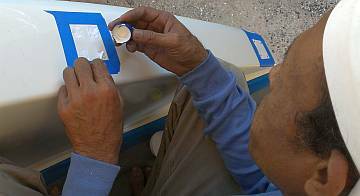 With the dinghy paint project finished, Baw was more visible up amongst the men on board. He got the galley window fine sanded and polished, so it glistens. We're so happy to not "have to" replace it. It looks more than fine! He also finished sanding the big block of teak which the mainsheet traveler winch sits on. The 20‑year‑old teak had weathered, and at first we'd thought we had to make a whole new base, but Houa assured us it was fixable. Baw set it right. 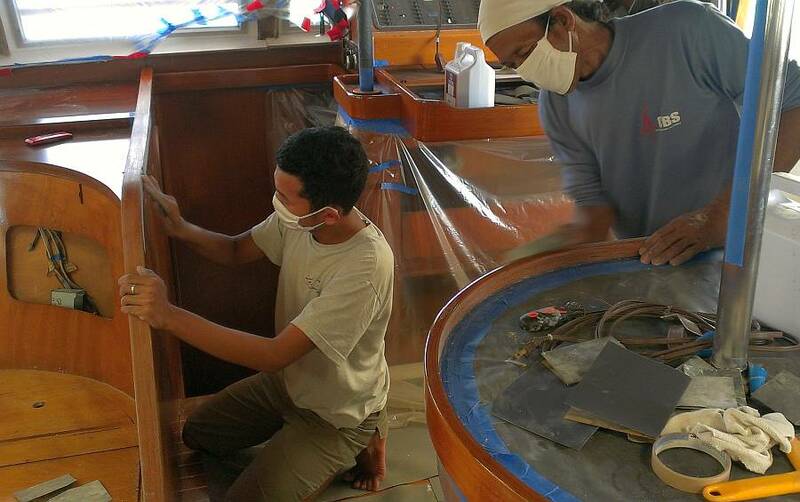 The cockpit teak stands proud of the surrounding gelcoat by a few millimeters, and after sanding the edge is quite sharp, so Houa supervised Yando and Chambron as they masked and rounded the edges of the cockpit teak. 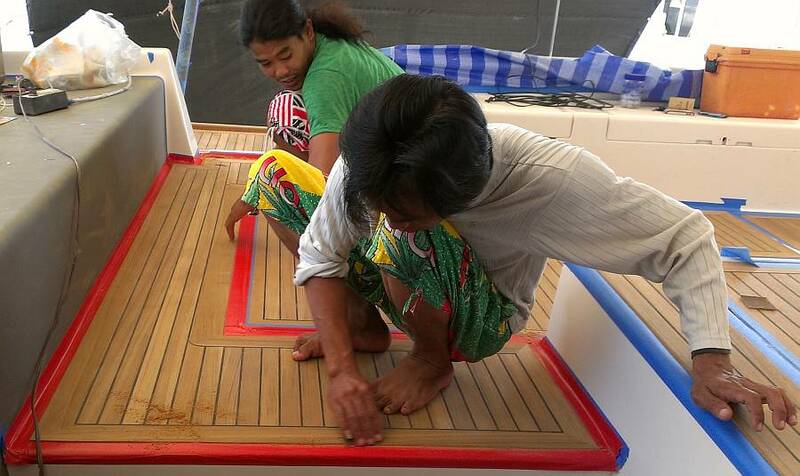 And down inside the boat, Houa was finally able to access the port passageway under the stairs (no men gelcoating around there anymore) so he got the plywood supports mounted for that last floor section, and even got them epoxy coated for water protection. Lek cut 1/8" (3mm) neoprene into gasket strips and glued it to the insides of the 4 big cockpit hatches. 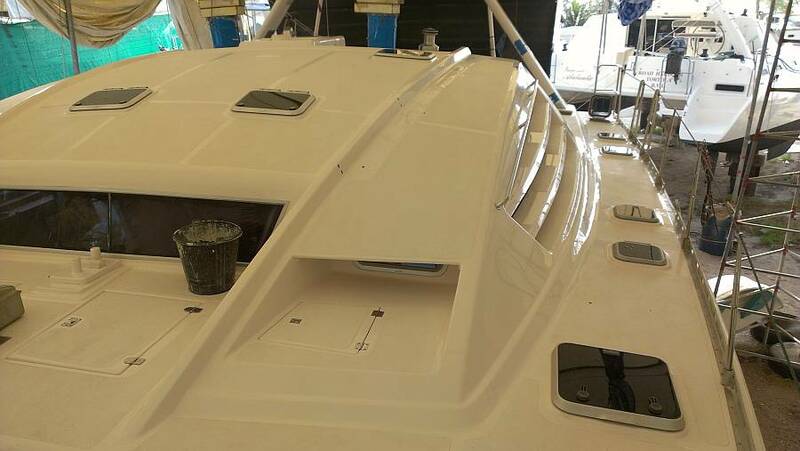 Now that they sit more or less level and the gelcoat trim around each hatch is polished, we can think about replacing the big hinges and handles. There was a lot of messy work in the salon. 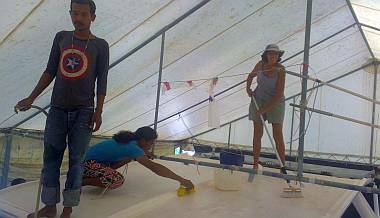 In the morning, Heru and others sanded the food lockers and by afternoon they gelcoated them. Someday we'll put food back in there! 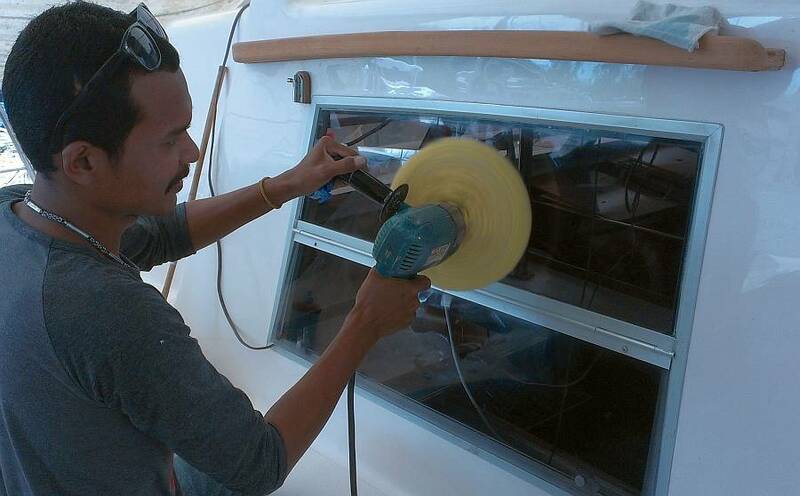 The not‑so‑fun project was the removal of the brand new polyurethane and epoxy coating on the starboard salon trim. This was put on just a few months ago, in the height of the wet SW monsoon, and we either had too much humidity in the air or the epoxy ratios were off, as we've now got a cloudy white "bloom" under the clear polyurethane. After reading up about it on the internet, Sue reached the conclusion that it was only going to get worse, and there was nothing for it but to strip the whole mess off and start over with bare wood. But NO epoxy this time. Gloss polyurethane only. It's not a big job as jobs go, but Baw estimates it will take about a man‑week, so it's a significant step backwards. The best forward‑movement was probably by Jon. He continued his work on the port engine, finally getting the big exhaust hose connected and remounting the muffler. Air bubbles in the high‑pressure fuel lines to the injectors probably prevented the engine from starting yesterday so he loosened the 4 injector nuts and turned the engine over until diesel was squirting from each one (first time he's had to bleed the engine). After tightening the nuts he decided to be brave and just turn the key. Sure enough, the engine turned over, started coughing, and caught! WOOT! The engine ran OK but Jon found a few issues. The electrical connections to the starter solenoid and the shutoff solenoid both need work, the oil pressure gauge isn't working, and Hem, our mechanic, neglected to tighten the top of our new Jack‑Master adjunct oil filter so it was spewing out oil (in our newly painted engine room!) until Jon tightened it down. Still, that's not bad for 2 years! Hope starboard is as easy. In the afternoon, Jon moved to the port sugar‑scoop grab‑rail. The gelcoat Lek used to cover the old mounting holes is a slightly different color, so we were able to tell about where the reinforcing fiberglass was for the mounting screws. After positioning the rail, Sue held it in place while Jon drew in where to drill the mounting holes. A dab of silicone helped the screws go in and only 1 blister later we had a firmly mounted grab‑rail! It's fun to see the new additions going onto Ocelot, instead of just repairs. By mid‑afternoon the men were chomping at the bit to begin washing the deck, but Sue found other work for everyone because she wanted to be there for the grand washing event and we were leaving soon. Jon took our scooter in for an oil change and some minor repairs, and while testing the work he had to brake suddenly on a sandy patch of road. The front wheel locked up and the bike skidded out from under him, landing him on the road which scraped 4 good patches of Jon's hide off down his right side. He picked himself up and decided it was time to start our Christmas holiday. We scootered off about 3:30, packed and cleaned up at the apartment before heading for the long, sandy beach at Nai Yang, near the Phuket airport, but a world away. Christmas Eve included a wonderful swim in the clear cool waters of the Andaman Sea, a brilliant sunset with a glowing ball of sun in the western sky, fun food, a gift exchange, much laughter with good friends on CanKata and Vamp, and a glorious night's sleep on a gently rocking catamaran. Ah, we love the cruising life. Our beautiful Christmas morning began with hot Milo in the cockpit, then a breakfast feast of bagels, lox and cream cheese, with fresh coffee. While our hosts delivered Xmas goodies to friends in shops ashore, we visited other friends on Vamp to see what Santa brought them. We had lunch on the beach at Octopus: a spicy pomello (a type of grapefruit) salad and cashew chicken followed by a totally delicious swim in the clear cool waters of the Andaman Sea. We met the Vamps ashore for a pre‑arranged turkey dinner at another beach restaurant, then all returned to CanKata for Xmas pudding and hard sauce (a la Sue), laughter and good times. It's days like this that remind us why we're working so hard to get Ocelot back in the water! By the way, if you're looking for a great way to get into cruising, CanKata is for sale for US$ 220,000. She's a meticulously maintained Privilege 37' catamaran, outfitted for comfortable and safe world cruising and offered in sail‑away condition at a bargain price. Daryl made us eggs and banana pancakes before sending us off on our hour‑long scooter ride back to Ao Chalong and the boatyard. We found all the men there, already hard at work. Pla had the toughest job of the day. On Tuesday he'd cleaned the very deep, very oily, dirty bilge at the forward end of the starboard engine compartment, then painted it. Today he cleaned out the port forward engine bilge, then requested primer and paint. Luckily we still have both Jotun HB (high build) primer and Jotun 2‑part enamel on hand. But it made us realize he probably put the enamel straight on the (hopefully very clean) old gelcoat on the starboard side on Tuesday, as we don't recall him asking for primer. Oh well, it's an engine room. Chambron worked on the new supports for the port passageway floor. 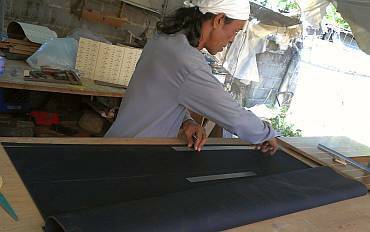 He cut the strips of neoprene and applied them with contact cement. He needed a bit of help from Baw to explain how the glue is supposed to be dry to the touch on both sides before pushing the parts together. Heru and Houa spent the morning in the cockpit sanding and rounding the edges of the teak‑topped hatches, removing the sharp edge of the hard teak so they're nice and comfy to walk on. Jon got the port grab‑rail installed on the outer wall down to the sugar scoops, and it looks great. Slowly, slowly we're getting all the shiny bits of stainless steel attached to Ocelot. Jon and Houa consulted on how best to mount the new cabinet doors in the heads. These are under the sinks, and have always had a silly mounting system, with 4 peg holes, and Velcro. Houa will be building them from 10mm marine plywood with white formica over the top, and a stainless steel piano hinge down the side. The Great Deck Washing, which was the day's big event. Sue would have preferred to use only Boat Soap and Nonskid Cleaner products, but Baw was adamant that Vixol, the local bathroom cleaner, was the best to get rid of stains and heavy dirt on the nonskid. We went along with him for today, but we have read that such cleaners are too harsh for the nonskid and over time will damage it. With 8 people crawling all over the wet, soapy deck it was quite a zoo. 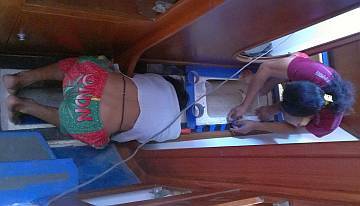 Unfortunately the water pressure was insufficient to get hose water up to the bimini or solar panels. It took Jon several tries to get the idea across that the men needed to fill buckets (to which Sue added boat soap) and hand them up to the top of the bimini. Sue did the long‑handled deck brush cleaning of the solar panels themselves. 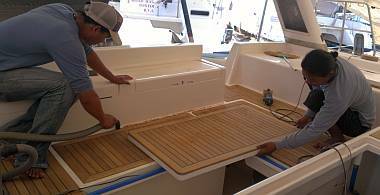 Then others took over to scrub the bimini. The men did lots of close‑up scrubbing with soapy water, and soon the deck was looking bright white. Having a clean deck means we'll be able to see the gelcoat errors or blemishes, and get them all touched up. Friday, December 27: It's a BOY! Bit of a different day. Heru wasn't there for the first time in 5 months because his wife (Baw's older sister) gave birth to a baby boy! His first child, but apparently the mother's 4th. Baw only worked half a day and then went to see the baby, taking Heru's pay and a gift from us. Pla got the hero's award for the dirtiest, hottest, and most difficult job. He got a coat of Jotun 2‑part enamel on the forward part of the port engine room, on top of yesterday's Jotun HB primer. We think he wants to put a second coat on tomorrow, for better coverage. 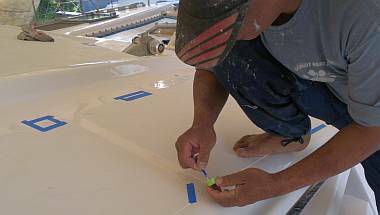 Then he moved up on deck to find all the places the gelcoat needs little repairs. Pla is very meticulous about this, and does a good repair job with dit‑dots of gelcoat. 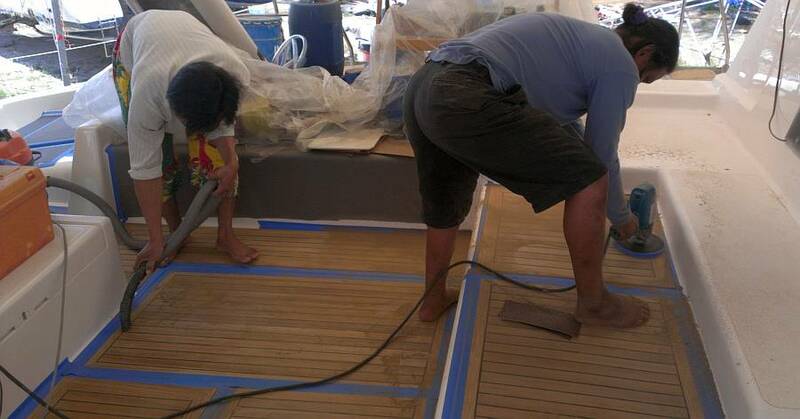 Sue walked the decks with him, noting where he had marked problems with blue tape and finding more with him. He mixed up a few tablespoons of gelcoat with hardener, and then set about dabbing the gelcoat onto the sanded and cleaned little spots. Houa arrived carrying a roll of white formica in his arms. How the men ride scooters with all this stuff is amazing! He worked on the new locker doors for the heads, cutting and trimming 4 pieces of 10mm marine plywood, then epoxying the outer surface for waterproofing. The formica will get cut and applied tomorrow, using epoxy to keep it waterproof instead of the more normal rubber cement. Houa also figured out the slight wobble and gap in the last floorboard at the foot of the port steps to the cabins. He did some carpenter magic and made both the gap and the wobble disappear, then painted epoxy on the newly cut edge. Tomorrow we can mount the last of the floor pieces. Houa's third project was to build little teak brackets to support the cups and mugs shelves in the galley. They shelves used to be held up with little plastic "L" shaped tabs, but they didn't all survive the Great Stripping Of Ocelot and we can't find any to buy. So, teak to the rescue. 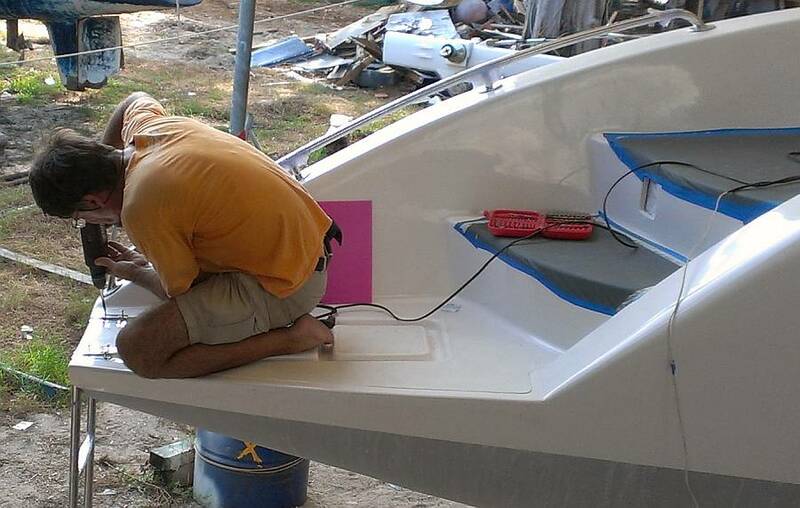 Jon realized that if he could finish the electrical projects, the guys could work on replacing the headliners, which will keep them busy for several days. The cables for the 2 new depth transducers are the big items here so Sue retrieved all the equipment from the storage room and Jon started fitting the through‑hull housing for the portside transducer. The area was sanded, cleaned and liberally coated with marine silicone before Sue pushed the transducer housing through the hull and Jon screwed on the big nut from inside. Starboard side has 2 housings to mount, which will close up all major holes in Ocelot's bottom. We took our picnic lunch to the apartment for a change, and were able to Skype both Chris and Amanda (who were together) and get in a nice long (if slightly belated) Christmas phone call. Jon made a 5‑item list of things to hunt down in Boat Lagoon and scootered off after lunch. Many shops and chandleries will be closed all week for New Year's and we are trying to anticipate our needs in advance. Not always easy, as we are constantly getting surprise hardware or fitting news. He returned with 2 of the 5, the most important being 316 stainless steel screws for the swim ladder hinges, so we can get them mounted, which will let us mount the stainless "bumpers" on the transoms. 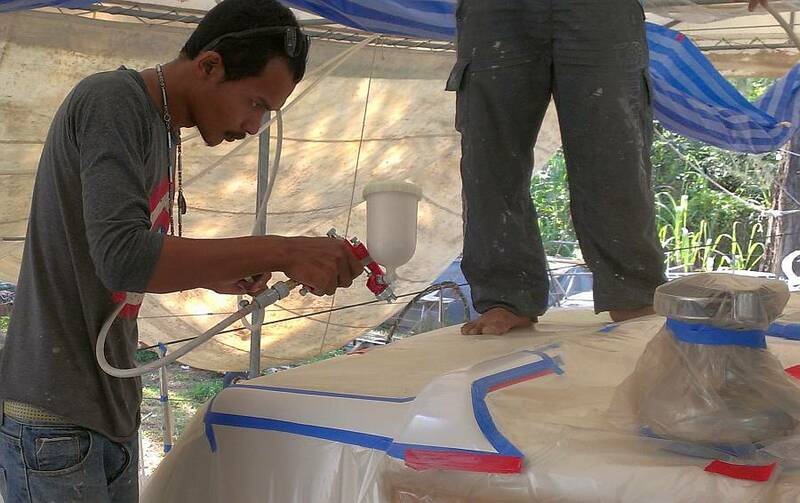 Ben and Lek worked on the salon polyurethane, sanding it smooth and then cleaning it before applying another coat. Then both moved on to smaller jobs, cutting back excess silicone from some of the deck installations and cleaning up the head cabinet door areas, especially scraping off the old Velcro strips and the rubber cement under them. Once these areas are clean, Houa will be able to install the new doors on their new piano hinges. Kind of a bitter‑sweet day as we got good work done, but are ready to cast a few workers free. That was a decision left mainly to Sue, and wasn't easy. First, though, there was work to be done. Lek, Baw, Ben and Chambron got yesterday's second coat of polyurethane sanded in the salon, galley and nav‑table area. Baw got a new (third) coat put on before lunch. Then sanding happened again in the afternoon, and the fourth coat was applied. It's building up, looking glossy, but maybe only half way there. Pla spent the day with the detailed gelcoat repairs. He and Sue crawled around the deck looking for places that were thin or showed the nonskid base. He marked them with blue tape, then either "drilled" them (just twirled a drill bit into the small holes) or sanded the spots. He got small dit‑dot repairs done all over the deck and was able to sand some of them in the afternoon. He and Chambron also masked off larger areas that needed spray repair. Baw mixed a larger batch of color‑matched gelcoat and did close‑up, small‑area spray repairs to 7 places on the deck, using very low air pressure so there was minimal overspray. Monday we get to see just how well he was able to match the colors. Fingers crossed. Sue played with hydrochloric acid (HCl) and the old zinc anode from the outboard. We were not able to find a replacement for this Mercury anode, so we've decided to clean the old one up as much as possible and use it for a while longer. The HCl foamed and bubbled, eating away the white calcium deposits on the anode. What was left was a pretty pitted piece of zinc, but with about 80% of its metal still there. Jon's first big job today was getting the second depth transducer and the speed transducer (paddlewheel) both installed in the starboard hull. 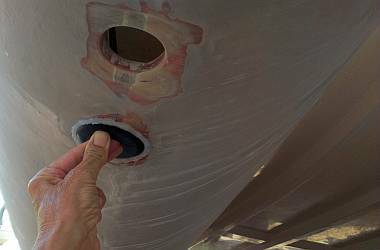 First the outer hull needed to be sanded flat around the mounting holes, then all the mounting surfaces were roughed up and cleaned, silicone sealant applied, the transducers pushed up from outside, and a big plastic nut tightened them to the hull from the inside. It all went reasonably smoothly despite the new high‑power depth transducer being a monolithic unit with a thick cable attached. Now we have to run the wires back to the nav‑station so they can plug into their instruments. Sue is fighting yet another sinus infection, so she scootered off to the Ear‑Nose‑Throat clinic and was back in time for transducer #2 and lunch. Her whole visit, including the consultation with the doctor, a nasal spray, and a course of antibiotics, cost $40. In the afternoon Jon led 2 scooters and 3 other men off to Chai's workshop to collect our polished and newly bracketed cockpit table mounts. One more job brought "home" and ready to be dealt with. The cockpit floor has to be cut back so the mounts can be inserted and bolted down, the table has to be screwed to the mounts, and the new swing‑out brackets need soft pads to protect the tables. Then Jon concentrated on the port swim ladder. He drilled and mounted the ladder hinges carefully so the ladder hangs vertically and has a bit of a gap for a rubber "bumper" between it and the hull. But in this position the ladder touches the gelcoat when it lays in the grooves of the swim platform. So he used his Dremel to remove excess gelcoat and a bit of fiberglass in the groove. Baw knows that he will have to re‑gelcoat that area a bit. Houa brought 2 meters of stainless steel piano hinge which he'll use on the locker doors in the heads. He cut new white formica pieces for the front, back and side trims for those lockers. He had hoped to mount the formica today, but some of the protective epoxy was not hard enough to sand, so it will all have to wait until Monday. Meanwhile, inside Ocelot, Ben and Yando got the areas under the sinks all cleaned up and ready for the doors, then they polished bits and pieces of metal like the shower mounts, the towel rack ends and the door stops. You can tell we're down to the end of the big jobs. At least we hope so! Although there is still lots of work for Jon to do, we're running out of work for the men, so Sue talked with both Baw and Houa about who to keep on and who to let go. Baw would not comment. Fair enough, as he is close to them all, and probably wanted to put the "blame" for lack of work directly on our shoulders. Houa said he would like 2 men to help him with the headliners next week, and he suggested Yando. Jon wants one man, either Baw or Heru (both with good English) to help him. Sue wants more engine room and gelcoat touch up work done and Pla is game to get in the engine rooms and is very good at finding needed repairs to the gelcoat. So our work force is being reduced starting Monday, when we will have Houa, Baw, Pla, Yando and Heru, but not Ben, Lek or Chambron. Unfortunately, the yard management has changed and they're no longer in the business of supplying workers, but we'll do what we can to help them find work, like supplying them all with letters of recommendation and a certificate of work done on Ocelot. Making these items is now on Sue's list of Things To Do.